DNA is the most powerful tool available for identification in forensic investigations. Because of its ability to line physical evidence found at a crime scene to a single person, it is often referred to as a “digital fingerprint”. This method is so precise that it can ensure pinpoint accuracy, down to one in over a billion. And, unlike fingerprints, which can only be found if a suspect touches something, DNA exists in every cell of the human body, from hair and blood, to skin and tears, and can be shed of deposited while committing a crime. That means it is often the only means for accurate identification. DNA databases make it possible for law enforcement crime laboratories to electronically search and compare collected DNA profiles of individuals to crime scene evidence. In the United States, the Combined DNA Index System, known as CODIS, links local, state and national databases and contains more than 13 million records. 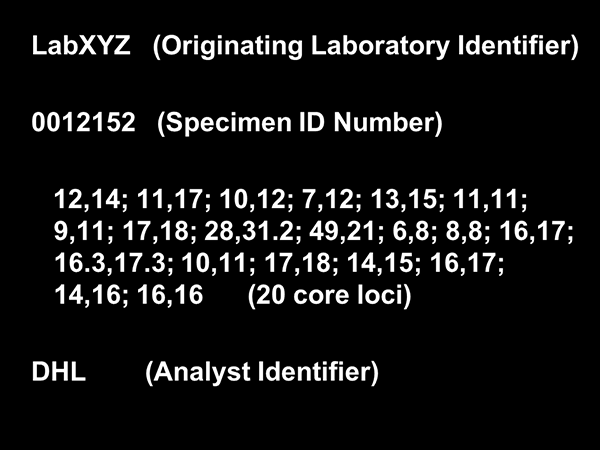 Analyze the sample to obtain a unique identifier containing only the 20 markers required to confirm identity. Enter the sample into CODIS, where it can be compared against forensic evidence from crime scenes across the country. What makes up a DNA profile on CODIS? Some have raised concerns about privacy rights surrounding DNA profiles. It is impossible to obtain medical information or any genetic information whatsoever. While the human genome contains over three billion base pairs, or markers, only twenty of these markers are digitalized to make up the CODIS DNA profile. These 20 markers were specifically chosen by genetic scientists because they contain NO medically predictive information nor genetic indicators. But when there is a match of these 20 markers between the crime scene evidence DNA profile and the offender profile, there is only one chance in 1,000,000,000,000,000,000 that it could be another person. The DNA profile is stored in CODIS as a numeric file, with absolutely no access to personal information. The information below (in white) is the ONLY information that is uploaded to CODIS. Only AFTER a crime scene evidence profile matches an offender profile and AFTER the profiles have been analyzed again to verify accuracy, is a name matched to the offender profile. The name is kept in the state crime lab in a separate, offline, heavily-protected computer file with very limited access. The name can only be released to the law enforcement team investigating the crime to which it was matched. This match is then used as an investigative lead. If and when enough evidence is gathered to officially charge the suspect with a crime, a warrant is issued to obtain another cheek swab from the suspect, which is analyzed to provide a DNA profile. This is the evidence that is used in court proceedings. DNA is science. When evidence left at a crime scene matches to an offender DNA profile, it is scientific evidence that leads to the right suspect, regardless of race or economic status, thereby reducing the incidence of racial profiling, unreliable eye-witness identification and other objectionable means of developing suspects. See the brochure for more comprehensive information.